A comprehensive review of the core content of emergency medicine! When purchased with our online review, we GUARANTEE you will pass your ConCert Exam or your money back! Emergency Medicine Text Book Like AAEM and Dr. Carol S. Rivers Physicians and laypersons alike are touting a new source for medical information on the Internet. ConCertPrep.com contains the best High Yield Emergency Medicine textbook just like AAEM Textbooks and Carl S. River�s Emergency Medicine Textbook. It is a complete medical reference for physicians to buy from all over the globe. This emergency medicine textbook can be bought 24 hours a day, 365 days a year, without the challenges and problems associated with the coaching schools and other traditional emergency medicine textbooks like AAEM and Rivers. 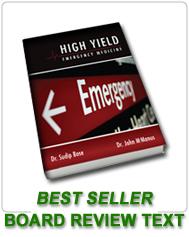 The high yield emergency medicine textbook is proven and widely accepted like Dr. Rivers� Emergency Medicine Board Reviews. 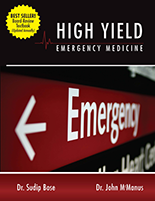 High Yield Emergency Medicine Text Book by ConCertPrep A COMPLETE high yield review package for the Emergency Medicine qualifying exam - based on the popular High Yield Emergency Medicine Textbook by ConCertPrep. Based on the acclaimed ConCert Review Course and drawing on valuable insights from top emergency departments, this review has everything you need to pass the Emergency Medicine written boards on your very first try. 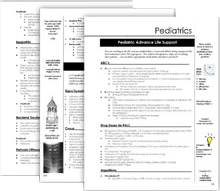 Here, you'll, get a concise walk-through of key emergency medicine topics, board-format Q&A, and a very high yield review with cases - all designed to give you a solid idea of what to expect on exam day. Intensive Review for the Emergency Medicine Text Book features a succinct outline format, yet it leaves nothing out, covering the full range of emergency medicine specialties. It all adds up to the ultimate board study companion - one that can help you recall information pertinent to the practice of emergency medicine and approach the exam with confidence.